Maryland Drivers Alliance: House Committee Given Testimony on Camera Errors, Due Process Violations: Was Anybody Listening? House Committee Given Testimony on Camera Errors, Due Process Violations: Was Anybody Listening? On Friday March 9 the House Environmental Matters committee heard testimony on several speed camera bills. The bills included House Bill 1044 (which StopBigBrotherMD.org supports), correcting several problems pertaining to testing requirements for speed cameras and due process issues which have been observed with existing speed camera programs. Also included were House Bill 944(aka SB486), which removes the requirement that police review citations and allows private contractors to have the final say in who receives citations (something which StopBigBrotherMD.org strongly opposes), removing a critical safeguard promised to the public when statewide speed cameras were implemented. Speakers in favor of House Bill 1044 included John Townsend from AAA, as well as a representative from the Maryland Public Interest Research Group (PIRG) which last year wrote a report about the privatization of law enforcement, cautioning on various types of conflicts of interest. Neither AAA nor PIRG oppose speed cameras if they are not used as 'cash cows'. PIRG argued that the legislation added 'necessary public interest protections'. AAA argued that the legislation was necessary 'to protect the integrity of the program', and that what they have observed taking in courtrooms 'was undermining public confidence'. Four citizens who had received erroneous citations from Optotraffic speed cameras appeared. One, Will Foreman, has been a frequent critic of the accuracy of Optotraffic cameras used by Forest Heights. However at this hearing three other recipients of erroneous tickets, who have no affiliation with Eastover Auto, also presented testimony. This included the owner of another business, who claimed that a car owned by him had been wrongly cited by Forest Heights at 75mph which he stated was not possible under the circumstances. Another ticket recipient, Earl Lomax, a retired police officer, had been cited for speeding by Forest Heights in his 40,000 pound RV only a short distance after he had turned onto MD210, traveling uphill, while towing a car behind it. 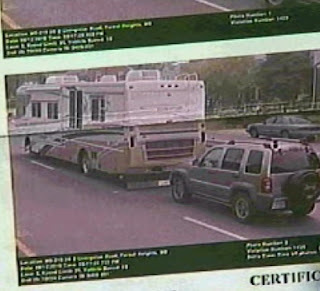 Lomax had contested his citation, presenting photos of the vehicle and of the area claiming that it would have been physically impossible to reach the recorded speed. However it took Mr. Lomax a year to receive his court hearing, and when he got there he was found him guilty, ruling that he could not contest the recorded speed, and was forced to pay a fine plus court costs. Unfortunately, some courts have denied that any defense against the recorded speed is allowable. HB1044 amends the law to require that a defendant be permitted to use citation images in defense of a violation. The editor of this StopBigBrotherMD.org also spoke and presented 30 pages of written testimony on HB1044, documenting numerous other examples of speed measurement errors. Included in his written testimony were references to the "false triggers" and erroneous speed measurements which the town of Cheverly had reported before their contract with Optotraffic was terminated. Also included were examples of errors not previously disclosed publicly. One example was an email obtained from the City of New Carrollton sent to their contractor, Optotraffic, which showed that the city of New Carrollton was aware of similar cases in 2010. Included in the email was an image of a 26" rental truck recorded at 68mph which was apparently NOT traveling that speed, as the police had labeled it a "False Camera Trigger". Optotraffic has in the past publicly claimed that nobody has ever shown them proof of errors. HB1044 attempts to address accuracy problems by forbidding the manufacturer of the device from certifying their own equipment. Currently state law only requires equipment to meet a "manufacturer specification", and the state law defining the requirements does not even contain the word "accuracy". HB1044 would instead require an objective testing standard set by the IACP(International Association of Chiefs of Police) and NHTSA(National Highway Traffic Safety Administration). Both the Montgomery County Safe Speed programs and the Maryland Safezones programs requested IACP approved equipment as part of their original RFPs, however some jurisdictions have chose to accept lower standards. StopBigBrotherMD.org's written testimony included examples of denied FOIA requests. Other individuals spoke regarding FOIA requests which had been denied by local agencies running speed camera programs as well. 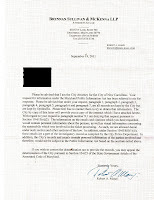 One individual presented documents showing how the City of New Carrollton blocked a public information act request, claiming all the calibration certificates, logs and records pertaining to the operation of the device were in the hands of the contractor, even though the city claims that they, not the contractor, "operate" the device. The town of Laurel had denied a similar request made by a different individual, making the exact same claim that all records were possessed by the contractor. The issue of disclosure of calibration and testing records is one of those addressed by HB1044. StopBigBrotherMD's testimony did explicitly address a "Red Herring" argument publicly raised by College Park who claimed the bill making citation images disclosable. This provision of the bill was intended to ensure that ticket recipients can use the original, high resolution images captured by the device can be used in defense of a violation. An existing law prevents disclosure of citation images except to a "Person In Interest" and that law would not be changed by HB1044. StopBigBrotherMD's testimony specifically recommended that amending the bill to state that images were disclosable “except as prohibited under § 10-616(o)” would ensure that there is no misinterpretation that the meaning of the bill is only to disclosure of images to the ticket recipients themselves so they can use the original high resolution images to contest a violation. College Park's contract with Optotraffic already requires the company to retain images for 2 years, and images are already downloadable by ticket recipients, and as such no major change to existing programs would be required to meet this requirement. Frankly we think it takes a lot of nerve for a city which hangs cameras on every corner to monitor its citizens to make deceptive public statements about privacy violations. College Park's program brought in a total of $3.6million worth of ticket fines in FY2011 and is one of the most profitable municipal speed camera programs in the state, due largely to the fact that the city deploys cameras at 'speed transition zones' at locations where the speed limit drops by 10mph, which are not in any posted school zone. However it is doubtful the committee was listening. The oral testimony on the bill was limited to 60 seconds from each speaker, with a buzzer going off at the end of the period. Normally at such hearings each speaker receives 3 minutes. The committee asked no questions of any of the panel members: not of the editor of this site who has 4 years of experience documenting speed cameras issues, nor of AAA who had received complaints from its 900,000 members in Maryland about various speed camera issues, nor of the PIRG who had conducted extensive research on the consequences of outsourcing law enforcement to private contractors. Testimony was also presented by StopBigBrotherMD.org and AAA against another bill, House Bill 944(referred to as as SB486 in the senate) which removes the requirement that speed camera citations be reviewed by police. StopBigBrotherMD presented an additional 19 pages of testimony including numerous additional examples of speed camera errors, including examples of tickets issued to the wrong vehicle not previously disclosed publicly. This also included referencing a recent report in Baltimore City where over a thousand speed camera citations were issued in error. John Townsend of AAA also referred to the currently inadequate citation review procedures of some jurisdictions, pointing to a case in Baltimore where a deceased police officer had "approved" over 2000 red light camera tickets. One of the sponsors of HB944 (Barbara Frush) responded to AAA's claim by stating "I Rest My Case" presumably meaning that she believes this shows citation review is not important, to which Townsend responded "if anything, more oversight is required." Supporters of HH944 this time tried to claim that an amendment in the Senate version of that bill would prevent private contractors with a conflict of interest from receiving . One opponent of the bill, who appeared as a private individual, pointed out that the language of the amendment only excluded "a contractor who operates a speed monitoring system" from being paid. An existing provision of state law currently is supposed to forbid "a contractor who operates a speed monitoring system" from being paid based on the number of citations, yet in reality MOST local speed camera programs in the state pay their contractors based on the number of tickets issued. As such, the referenced amendment would have no effect whatsoever and would NOT prevent contractors from approving tickets, even if they received a financial incentive to maximize "throughput". With the exception of AAA and PIRG, none of the other individuals testifying for HB1044 and against HB944 were experienced lobbyists, and needed to take off work to prepare and present their cases. On the opposing side, uniformed police officers being paid with taxpayer dollars were sent to testify favor of House Bill 944, arguing for less oversight of speed cameras while being paid out of the taxes of citizens who receive citations. Speed camera contractor ACS sent a paid professional lobbyist to argue against HB1044. On March 12 the senate voted in favor of another version of HB944, Senate Bill 486 (removing the requirement that police approve citations). This means is will be up to the house committee and then the full House of Delegates as to whether to remove one of the critical safeguards which was promised to the public and whether for-profit contractors should have the final say in who receives citations. Meanwhile, a member of the committee stated that HB1044 would be sent to the transportation subcommittee.... which is probably where 'inconvenient' legislation is sent to die. If you want to keep it (and your legal rights) alive, contact your state lawmakers and tell them to **SUPPORT HOUSE BILL 1044** and to **OPPOSE HB944/ SB486**.